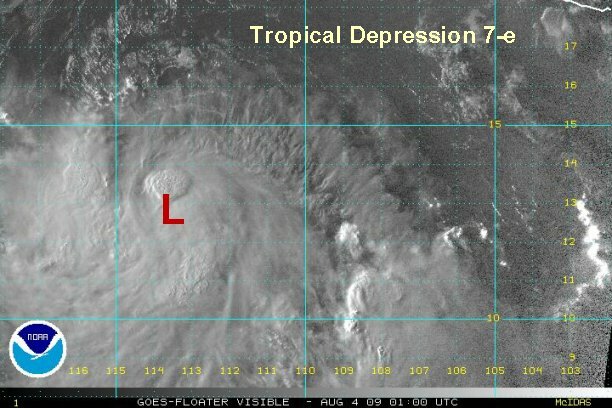 Tropical depression 7-e was officially classified earlier this afternoon. As of 9:30 pm edt / 6:30 pm pdt it was centered near 13.0° N / 113.7° W or about 720 miles south southwest of Cabo San Lucas, Mexico. Deep convection has increased and we believe that tropical depression 7-e is now tropical storm Enrique. NHC will probably classify this system soon. We estimate top sustained winds at 40 mph. 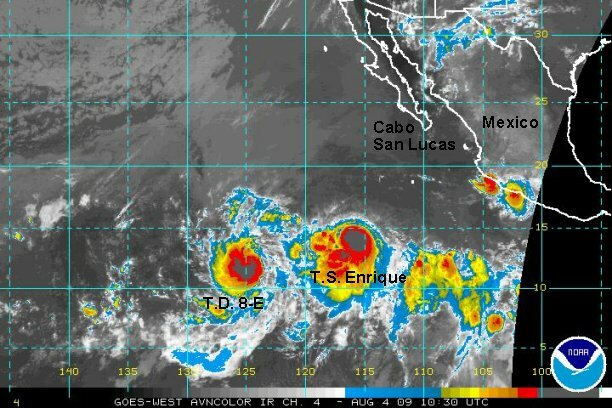 Tropical storm Enrique was continues to develop and move far away from Mexico. Outflow is being hampered on the northern side of the circulation, possibly from the outflow of tropical depression 7-E (Felicia) from the west. As of 6:30 am edt / 3:30 am pdt it was centered near 13.8° N / 116.2° W or about 740 miles south southwest of Cabo San Lucas, Mexico. Once again, excellent center estimates are difficult during the night with I.R. imagery. We estimate top sustained winds at 45 mph and increasing with the deep burst of convection currently underway. It is moving west northwest at about 15 mph. Conditions are favorable for futher strengthening as it moves out to sea away from Mexico. NHC increased Enrique to 60 mph. On our earlier update we estimated 45 mph and increasing. We agree with this assessment as outflow and organization look impressive on visible satellite. Enrique may come close to hurricane strength in the next 24 hours before reaching cooler water. 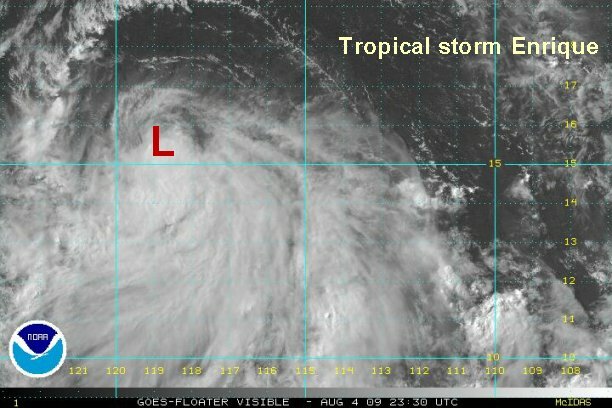 Tropical storm Enrique appears to be fighting some shear on the north side of the circulation probably enhanced by Felicia to the west. There also appears to be some dry air that has wrapped into the circulation. As of 3:30 pm edt / 12:30 pm pdt it was centered near 14.6° N / 117.8° W or about 760 miles south southwest of Cabo San Lucas, Mexico. We estimate top sustained winds at 50 mph and possibly a little weaker. It is moving west northwest at about 13 mph. Enrique may go through some weakening and strengthening phases with shear in the next 24 hours. 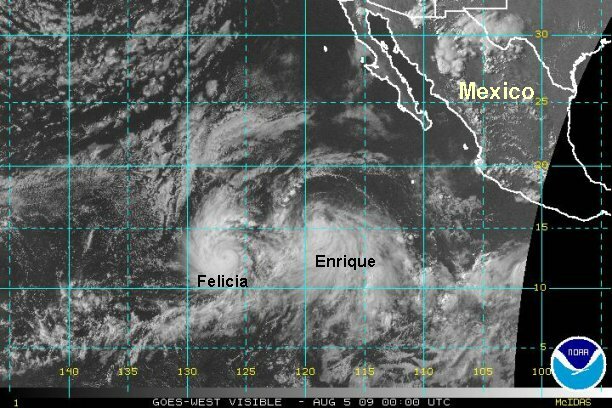 It is interesting to note the forecast models wind speed in which they have Enrique stronger than Felicia. That certainly isn't the case at this time. NHC left the wind speed still up at 60 mph on their last advisory. We'll stick with 50 mph. Tropical storm Enrique is still fighting shear. Convection near the center looks weak, but still very organized and is increasing on the southern half of the circulation. 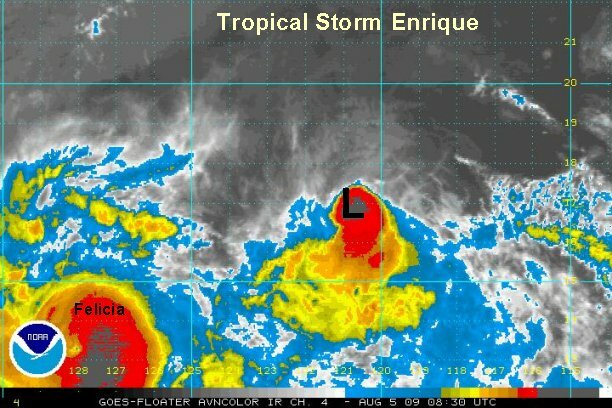 As of 8:30 pm edt / 5:30 pm pdt Enrique was centered near 15.3° N / 119.0° W or about 780 miles southwest of Cabo San Lucas, Mexico. We estimate top sustained winds at 60 mph. It is moving west northwest at about 13 mph. 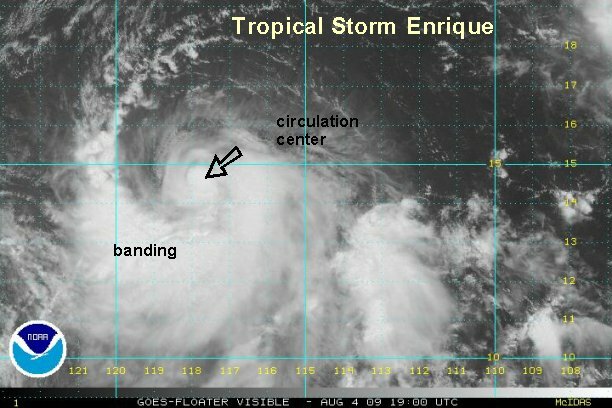 Enrique may go through some weakening and strengthening phases with shear in the next 24 hours. 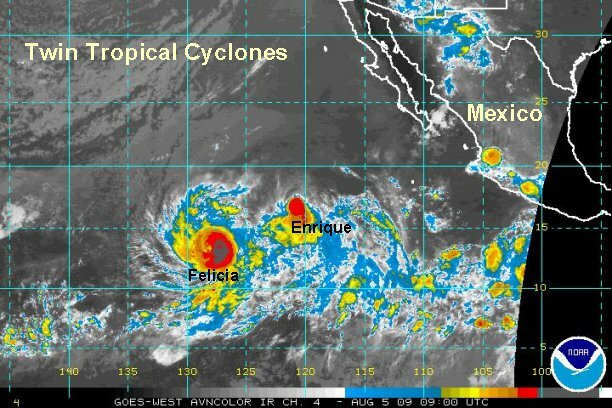 As of 5:00 am edt / 2:00 am pdt Enrique was centered near 16.8° N / 120.8° W or about 825 miles west southwest of Cabo San Lucas, Mexico. We estimate top sustained winds at 50 mph or slightly weaker. This is in agreement with NHC. It is moving west northwest at about 15 mph. 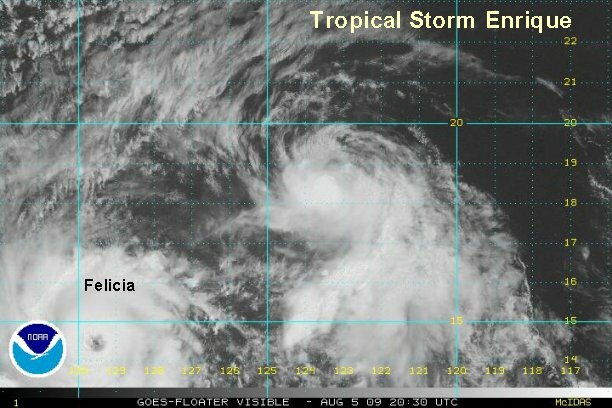 Wind shear enhanced by the proximity of hurricane Felicia will continue to hamper development on tropical storm Enrique. The northern side of the circulation continues to struggle as northerly shear keeps convection near to and south of the circulation center. As of 5:30 pm edt / 2:30 pm pdt Enrique was centered near 18.4° N / 123.5° W or about 925 miles west southwest of Cabo San Lucas, Mexico. We estimate top sustained winds at 50 mph. This is in agreement with NHC. It is moving west northwest at about 13 mph. 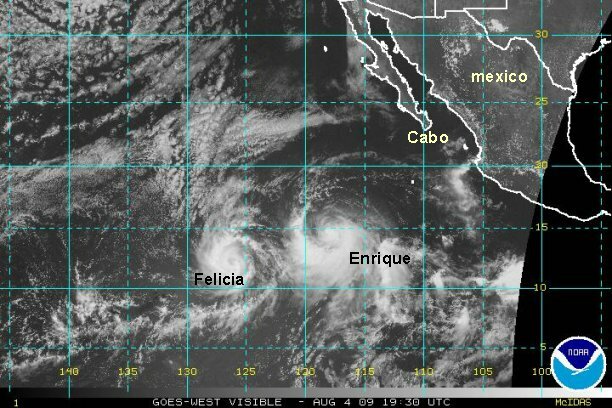 Tropical storm Enrique is still moving northwest and is not being absorbed by Felicia. The two tropical cyclones are close enough for a Fujiwhara effect. The main effect to Enrique has been wind shear from Felicia weakening its strength. Both systems have had some directional effects also. 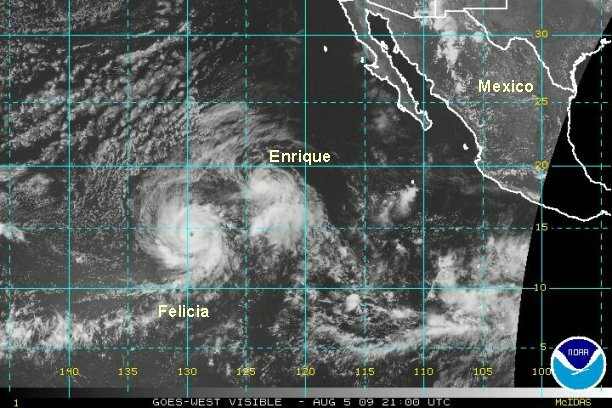 Enrique will not be a concern to Mexico or Hawaii. 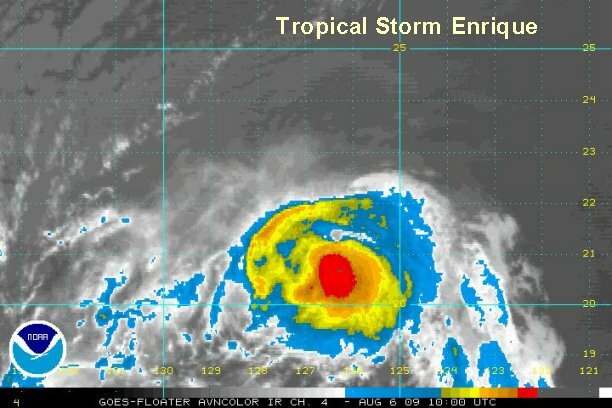 As of 7:00 am edt / 4:00 am pdt Enrique was centered near 20.7° N / 126.7° W or about 1080 miles west southwest of Cabo San Lucas, Mexico. It is moving west northwest at about 17 mph. Tropical storm Enrique has not changed much at all in appearance for the past 24 hours. Despite Hurricane Felicia in fairly close proximity and the wind shear that its battling, Enrique has not lost its convection nor is any closer to being absorbed. 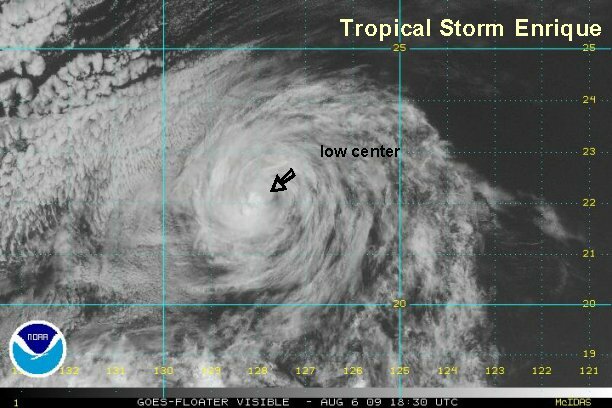 As of 3:00 pm edt / 12:00 pm pdt Enrique was centered near 22.2° N / 128.0°, W or about 1150 miles west of Cabo San Lucas, Mexico / 1750 miles east northeast of the Big Island of Hawaii. We estimate top sustained winds at 40 mph. It is moving west northwest at about 17 mph. 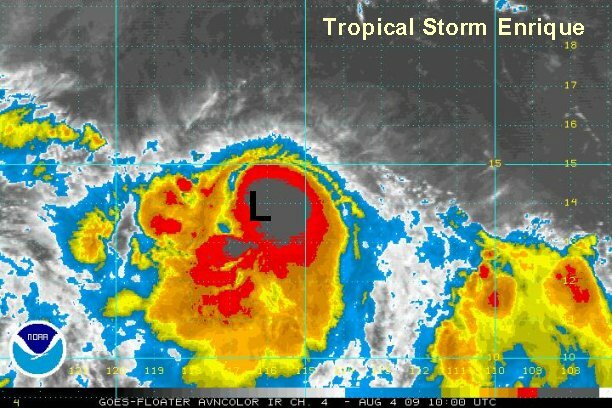 Wind shear is slowly taking its toll on tropical storm Enrique today. It is a minimal tropical storm and will likely become a tropical depression by this evening or tonight. It is holding onto a small area of convection on the south side of its circulation. Enrique was declared a depression on the last advisory. This will be our last update on this system.